Supergirl first appears on the 1990s’ Superman: The Animated Series as a survivor of Krypton’s sister planet Argos. After being rescued by Superman, Kara creates her own superhero costume and eventually joins the Justice League on the sequel series Justice League Unlimited . Supergirl is voiced by Nicholle Tom. When Krypton exploded, its smaller neighbor planet, Argos, was thrown out of its rotation and sent flying into space. Fortunately Argos’ top scientist convinced the people of Argos that Krypton’s destruction was at hand, and together they managed to construct a force field that maintained the gravity and atmosphere of their planet. For sixteen years the residents of Argos survived. In time Argos’ force field began to fail, and, sensing the end of their world, the scientist placed her family in cryo-tubes to preserve them until help could arrive. Kara, however, was the only one to survive. Clark was delighted to know there had been another survivor of the Krypton system. Inspired by her “cousin” Clark, Kara has made a costume similar to Superman’s and occasionally joins on missions as Supergirl. Kara frequently visits Clark in Metropolis and, as Supergirl, she has full access to Superman’s Fortress of Solitude. Because Argosians and Kryptonians sprang from a common humanoid ancestor millions of years before, Supergirl’s powers closely parallel Superman’s. As a result, Supergirl has powers that are similar to Superman’s (flight, strength, heat vision, super-hearing), but is more resistant to Kryptonite. (Exposure to the radioactive element would kill Superman in about twenty minutes but Supergirl could hold out for several hours.) Also, because Supergirl is nearly half Superman’s age (16), her powers are not quite as strong as his. She more than makes up for this in attitude, which is cocky, hip and very independent. With Supergirl, Superman has a living link to his alien heritage, and someone he can talk to about his dual lives as Superman and Clark Kent. She is a frequent friendly ally who can be trusted with Superman’s secret. 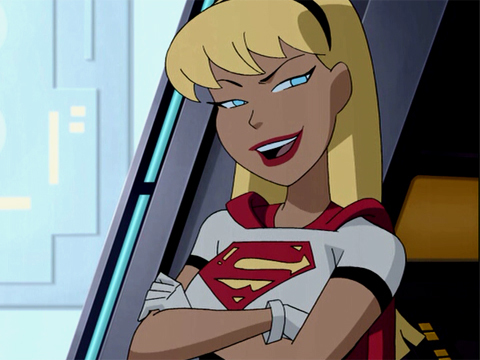 Supergirl (voiced by Nicholle Tom) appears on Superman: The Animated Series and Justice League Unlimited as Kara In-Ze, the last survivor of Krypton’s sister planet Argos. When Argos was throw out of its orbit by Krypton’s explosion, Kara’s mother Kala In-ze, the planet’s top scientist, constructed cryogenic chambers in an attempt to save her family before Argos became inhospitable to life. Tragically only Kara survived the process. Upon being brought to Earth by Superman, she fashioned a Supergirl outfit for herself and set upon working with her “cousin” to help the people of Earth as she could not help the people of Argos. Supergirl’s costume features some unique elements not previously found in Supergirl costumes, such as a white cropped t-shirt, gloves, and shorter lace-up boots. This costume appeared in the comics when Linda Danvers crafted her Supergirl costume in SUPERGIRL #51 (2000). In the final season of Justice League Unlimited , when Kara has aged to around 20 years old (2), she creates a new costume that is closer to the traditional blue-and-red Supergirl costume. Supergirl joins the expanded roster of the Justice League in the opening episode of Justice League Unlimited . In the last season she is taken to the 31st century where she meets the Legion of Super-Heroes. Feeling more at home with that era’s advanced technology and her new friends in the Legion, she decides to remain there permanently. The creators of Superman: The Animated Series originally intended to use the original Kryptonian version of Supergirl from the Silver Age. However, at that time, DC Comics company policy mandated that Superman be the sole survivor of Krypton. The show’s creators got around this in a very clever way: in the series Argo City became a planet named Argos that had been settled by Kryptonians. Technically Kara was not Superman’s cousin when she was introduced in the Superman series, but she was treated by the other characters in a familial way. By the time of Justice League Unlimited , the DC Comics ban on Supergirl being Superman’s cousin had been lifted, and she is referenced in JLU as being his cousin. “She’s sort of a cousin, in terms of being from pretty much the same race and, when she shows up on Earth, she’s a feisty 16-year old. She loves being here, she loves being able to fly, she loves having powers. […] She really wants to join up with Superman and help him whenever she can […but] he’s very protective of her because he doesn’t want her rushing into some battle with a supervillain and getting killed. He wants her to realize there’s responsibility involved in what she’s doing. The show made one significant change to the comics canon that was quite refreshing. In the Silver Age origin story, Kara’s father Zor-El is a brilliant scientist like his brother, and creates a spacecraft for his daughter based on Jor-El’s designs. Zor-El leads the effort to save Argo City by constructing a forcefield around the planetoid. The animated series portrays Kara’s mother as a scientist and the one who saved Kara’s life by devising the plan for constructing a forcefield around Argos and building cryochambers for her family. Kara In-Ze is named after her mother, who in the comics was named Alura In-Ze before she married. This revision would later influence her comics reboot, which revealed Alura to be a brilliant scientist who was shown building Kara’s spaceship in Supergirl #24, 2008.